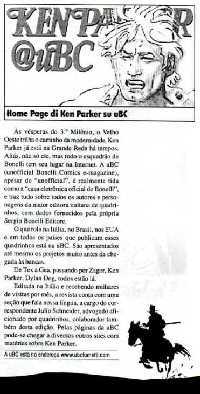 Ken Parker's first Brazilian issue had been published in the month of November by the Editora Vecchi. Back than, it was a particularly good period for Bonelli comics issued in Brazil. Vecchi had already been publishing Tex and in the last few months, Zagor. The "hot seller" was without any doubt Tex, so much so, that on Zagor's and Ken's covers the message "Tex presents" would appear. The Brazilian format of Ken was slightly reduced in respect to the original Italian measurements of: cm 13.5 by 17.5. 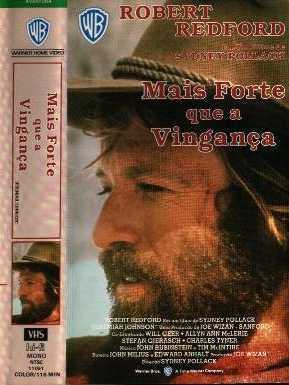 Ken-Robert Redford in "Jeremiah Johnson"
Vecchi's bankruptcy interrupts all publications of Bonelli's comics. The last comic book of Ken Parker was n. 53, out in the month of August. The Editora Ensaio publishes a special book of a larger format (20 by 27 cm) that contains two stories: "Os Cervos" ("Puppies") in color and "Un Halito de Gelo" ("A Breath of Ice"), in black and white. Unfortunately this was to be a onetime thing, and again fans of Ken would be waiting another 5 years for new publications. Finally, two years ago the turning point. Wagner Augusto, a journalist, editor and founder of the CLUQ publishing house, decides to make use of all publication rights of Ken Parker in his possession. Ken Parker is the best comic book that I have ever read in my life […] The characters of Ken Parker grow old, change addresses and die. They are able to find themselves and move on, just like in real life. Many of the stories have made me cry. After a long period of abstinence, Ken Parker is back in Brazil […] This edition is great, its printing is right on time […] The stories are published in grand format into two episodes, released in a limited edition of 1,000 issues. Admirers of Berardi and Milazzo, I urge you to run to the stands. A thousand issues are just a few - God, let them print more copies, let them start reprinting the sold out stories, let Ken Parker become a subject of studies in the schools!! Thus, Wagner Augusto decided to continue the adventure with a new special issue, as always translated by Julio Schneider: this time its "Um principe para Norma" ("A Prince for Norma"). Out by the end May, the issue was once again in grand format (21 by 28 cm). A strip from the new book! 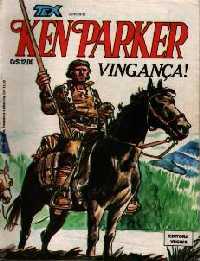 The introduction is signed by Sergio Bonelli himself, who enlightens about the editorial adventures of Ken Parker in Italy, its large aspect of innovation regarding previous western comics, the skill of its authors… and unfortunately, the difficultness of guaranteeing a regular release that of which will bring about the series suspension. "Ken Parker Collection"; "Ken Parker Reprint"